Radio-interlinked smoke alarms (Ei calls them RadioLINK smoke alarms) can be grouped into battery operated and mains powered models. 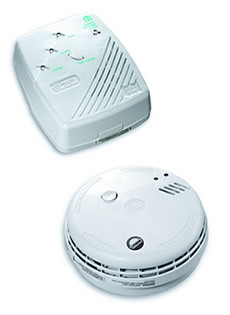 Both the battery operated smoke alarm series Ei3100RF and Ei600 as well as the mains powered ranges of the Ei140, Ei160 and Ei2110 series offer wireless connection between smoke and heat detectors. The Ei140, 160 and Ei2110 series require a RadioLINK base unit (provided by Safelincs when you order these units) to radio-link the alarms while the battery operated units have the RF (radio frequency) module already integrated into the actual smoke alarm. The purpose of radio-interlinked alarms is to ensure that when a smoke alarm detects a fire in one part of the building it notifies all the other alarms in the house per radio signal, triggering them to activate their sounders as well, hence notifying the occupiers of the building accross the entire building – and without the need for interconnecting cables. 1) Basic RadioLINK interconnection (models Ei3100RF as well as Ei140 with radio base): If one alarm goes off, all alarms go off. There is also the possibility to test the alarms with a remote test device and to use manual break points connected also with radio-interlink. However, the customer cannot for example silence or locate sounding alarms remotely. One alarm in such a system can act as a repeater to increase the reach of the network. 2) As above but with Remote Control Functionality (models Ei600 as well as Ei160 and Ei2110 with radio-base). Remote Control Functionality offers the possibility to remote test, hush and locate the alarms. Each smoke alarm unit can also act as a repeater, allowing these systems to cover larger buildings. All of the above units can be ‘housecoded’, meaning that the smoke alarms will only communicate with alarms from the same group and not with your neighbour’s system. This is achieved through simple housecoding of the units when you install the alarms. Where is the power-supply coming from? Ei140 series: Mains powered (usually from nearest light fitting) plus a 9V block battery as backup. Again, the 9V battery should be replaced every year. Ei160 series and Ei2110: Mains powered (usually from nearest light fitting) plus a re-chargeable, longlife lithum battery which will last the full ten year life of the smoke alarm. 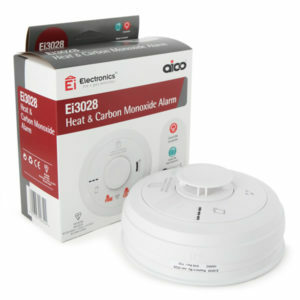 The Ei2110 multi-sensor fire alarm has won Best New Product at SELECT Electrotechnical Awards 2010. SELECT represents the electrical contracting industry in Scotland. These awards are in recognition of excellence and best-practice within the industry. As the Ei2110 Fire alarm is the first mains powered multi-sensor alarm suitable for residential use it ticked all the right boxes for the award. The dual sensor alarm offers better protection and leads to fewer false alarms. The Ei2110 comes with an easy to fit base unit, making installation very simple. This bespoke base unit automatically activates the lithium back up battery once the alarm has been fitted to the base. It is also compatible to interlink with other Ei smoke alarm ranges and can be sold with a radio-interlink base to allow wireless communication with other Ei radio-interlinked alarm products. Arm’s Length Management Organisation 2010 Rotherham Ltd is installing Aico Ei261ENRC mains powered Carbon Monoxide (CO) Alarms into its properties, interconnected with Aico Ei166RC Optical Smoke Alarms. The alarms are being fitted as part of 2010 Rotherham’s capital programme. The CO alarms are a new improvement to the tenants’ homes and are being installed in rooms where a solid fuel or an open flued appliances exists. It was chosen to interconnect the CO and smoke alarms together due to the fact that CO alarms need to be close to the appliance most likely to produce CO fumes – often away from bedrooms – and so there is a danger that an occupant sleeping upstairs may not hear the CO alarm. 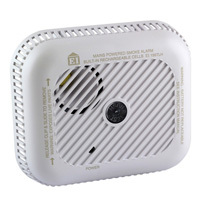 By interconnecting with the smoke alarms, all the alarms – CO and smoke – sound. To ensure the appropriate action is then taken (which differs depending on whether it’s a CO leak or a fire), an Ei1529RC Alarm Control switch has been installed in the main hallway, which has a ‘Locate’ function that can be used to identify the source of the alarm. 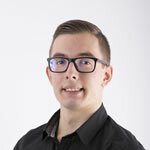 Billy Brooks, Electrical Project Manager at 2010 Rotherham, comments on the choice of alarm manufacturer: “We’ve been using Aico smoke alarms for quite a long time. Aico is one of the manufacturers to supply alarms with Lithium cells instead of batteries (as a back up to the main supply), which solved the problem of the batteries being removed. They also gave a good guarantee, with 10 years on the Lithium cell and five on the alarm. These were the reasons why we included Aico products into our specification. The Ei261ENRC CO Alarm from Aico features the latest generation electrochemical type CO sensor which automatically checks CO levels in the environment every 80 seconds. It comes with high and low level LED indicators with a special pre alarm LED indication for detection of CO at 50ppm and a memory feature which enables the user to tell if CO has been detected during a period of absence. The alarm also comes with a cost-saving replaceable CO sensor design and quick CO Gas test facility. Both the Ei261ENRC CO Alarm and the Ei166RC Optical Smoke Alarm benefit from 10 year+ Lithium cell back-up supply, hush button for false alarm control, separate mains and warning LEDs, Easi-fit fixing system for reduced installation time and effort and a comprehensive 5 year guarantee. All Aico alarms are designed and manufactured in Ireland and meet UK standards and regulations.